At the beginning, the Germans couldn’t find out whether the people were Aryans or Germans, so the German doctors and scientists decided to do something to know which people were the Aryan races and others, like Jews. In this picture it shows how the Germans measured people’s head (crane), noses, etc. They wanted everyone to be perfect. BELÉN CERVETTO. These people are some of the few survivors from the concentration camps. They live/lived in Argentina, and luckily, they were able to endure the terrible condition in the camps as they were finally rescued by the Allies Soldiers. Many of them have told their story to the world, while others were so affected and shocked by this dreadful experience that they kept that knowledge to themselves. FELICITAS MIRANDA P.
In this picture I can see one of the concentration camps, where the Germans killed lots of people. This concentration camp was built in Poland in 1941 after the invasion. There the Germans killed lots of Jewish and gypsies. These concentration camps were divided in sections and each section was fenced with spines wire. The main objective was to exterminate all Jewish and gypsies. They built 4 crematoriums with gas chamber. The large-scale extermination started in Spring 1942 as a result of acceleration of the Final Solution treated at the Wannsee Conference. This gas chamber had been destroyed by de SS (Schutzstaffel) because they wanted to hide the concentration camp from the Soviet troops. SILVESTRE TORRES ELIZALDE. In this picture we can se a student staring at a picture which shows a woman who survived the holocaust as the other people in the wall. This is a very important part of the holocaust museum in Buenos Aires because all the people who appear in these photos are people who came to live to Argentina after the Second World War . LUCÍA DARNET. In this fotograph we can see the uniform that Jewish people had to wear in concentration camps. Men and women were forced to use the same uniform, old people and babies were taken to jail and finally they were killed. The uniform consisted in a shirt and a pair of pants with blue and white stripes. Apart from this they had to wear a cap of the same colour. Each Jew had a number in the left part of the uniform and instead of using their own names the Nazis called them by the number they were given, if they didn`t remember that number they were killed. TOMÁS ROLDÁN. This picture shows the passport of a Jew, their passports were marked with a red “j” so that they were easy to recognize. Thanks to this, Jews were not received at any country. DELFINA TERÁN. It was really shocking to see this photograph because I knew that many people had died in the concentration camps but I'd never imagined that was so terrible. All the dead bodies heaped as if they were rubbish is a strong image where you can realize what was really going on with the poor people who were killed. Also, most of the bodies seem to be undernourished and maltreated. SOFÍA NOSEDA. 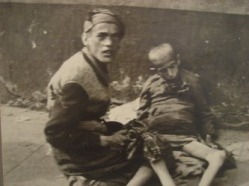 Photograph of a starving man, possibly a survivor of the concentration camps. This image may have been taken by an Allied soldier. It’s is a solid proof of the suffering many people had been put through in these camps which were part of Hitler’s “Final Solution”, and which still shock people nowadays. Many of these people were part of social minority groups, like gypsies, which had to endure the racism from the Nazis and most of the people. SOL CARREGAL. 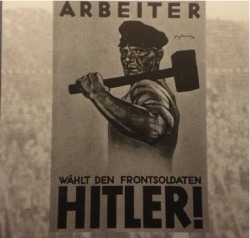 In this photograph we can see one of the many pamphlets that were used as propaganda from the Nazi Party. They usually said how good it was to join the party or even the army. Through this, people got to think that it was good to be a nazi because they lived in a society where the government hid all types of important information if that information didn’t make them look good. Those words in German mean “Employees, select the front soldiers HITLER!” ELENA PIÑON. This pictures the glass from (maybe) a shop. 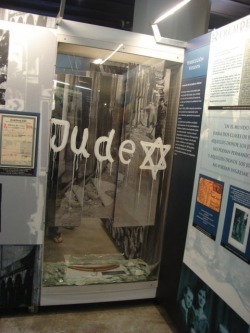 The German people did that because they were obviously against the Jews so when they saw that the shop was from a Jew they did not buy there or they threw things or the burned it . GONZALO FRÍAS. 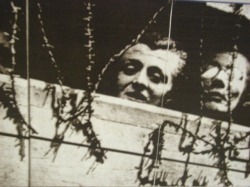 This picture shows two men, probably Jews, starving to death as a consequence of the horrible discrimination that they suffered from the Nazis. Hitler wanted to establish the ‘Aryan’ race, which he described as the ‘perfect’ race, this included being blond, white, having blue eyes, and there was no room for the Jews, the disabled people, the blacks, people with mental problems, etc. This was quite ironic, because Hitler didn’t match very much with these requirements that he established. However, he set the SS and the Gestapo to fight for his beliefs. We can observe in this picture how poorly they were treated by watching the skinny legs of the man in the right of the picture. This was certainly, one of the most shameful aspects that Germany showed among all the other historical events that they experienced. LUCAS OGALLAR.